I’ve been increasingly aware of the absence of a decent electro acoustic in my life; something smallish that I can sit on the sofa and play but that would also offer me options if I wanted to plug it into the Helix. So, after selling a couple of guitars, in came the Gibson SG and today? Today saw me heading up to Jimmy Egypt’s in Glasgow to pick up this lovely parlour sized Guild M-240E Troubadour. And loaded with a Dearmond Tone Boss passive pickup - tbh I’ve never really enjoyed the massive amounts of compression a piezo brings so this set up suits me down to the ground. Anyway, it has a lovely slim neck and low action which make my electric guitar familiar hands very pleased indeed. It’s as pretty as hell. And this is one VERY happy lady. And maybe find a “Baby to leave me...”? Sweeeet! You're on form lately Suzy, nice one. Gotta love the magnetic soundhole pickups. Also, I like the side-of-the-neck strap button placement, instead of the back of the heel, or no button at all ("traditional style"). Should belt out some killer cowboy tones! *Though, I'm pretty darn sure you didn't over pay for yours, like I did . I’d completely forgotten you had one of these Ty! They’re FANTASTIC wee guitars aren’t they? Honestly, the only reason I bought it (other than its simple, yet dashing good looks...), was I played a handful of the nicer acoustics this guy had, and this one was my favorite, and the second cheapest, and it played like it was worth the money, to me. So, good on Guild! 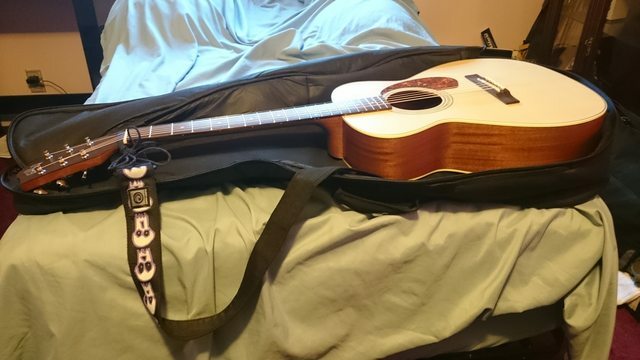 I do love it, and have played it so much, the satin neck is becoming highly glossy on the sides, heh. And I can't imagine where I got such a wonderful strap from. Some kinda strange package pixie dropped it in my mailbox. Clearly it was meant for greater things and sent to me by mistake . Awesome. Parlors are nice. I have an Ibanez Parlor from their Thermo Aged line. Don't why I ever bothered with all the other shapes. This size is awesome. I’m very interested in a parlour sized tbh, never tried one. I even forgot to ask my question: How’s it volume wise compared to a regular size acoustic? Oh and I forgot HNGD as well! I’d have to say this is pretty loud acoustic. It’s really punchy and I was surprised by that when I first tried it in the shop. EDIT: @everfreetree what would you say about yours? I have to agree with the "surprised by loudness" statement. Mine had old, crap strings on it, when I first played it, but STILL sounded surprisingly loud (in the shop), despite that, and then I went and put quiet, mellow, Silk & Steel strings on it, for a nice, relaxing tone, for finger-picking and such, and I really got used to it being quiet... but then, later, I put some phosphor bronze 11s (I don't do 12s. I'm weak and helpless) on it, and it DOUBLED in volume. Obviously not the same tone as it was with the Silk & Steels, but it's a nice, country and blues sound, at a volume that I wouldn't expect from something this size. I originally wanted a Gibson SJ or AJ, or something of that size/shape, but felt they were too large for my T-Rex arms. Now, I think they'd also be too loud, heh. One thing to consider, on volume from this size of guitar... is that these have arched backs, which is said to increase bass response and volume, on smaller guitars. That very well may contribute to the loudness.